It's not all about speed -Why not join us for a relaxed, luxurious sailboat cruise on Lake Pleasant? Our International Yacht Training DAY SKIPPER course is also an ideal way to learn 'Cruising Sailing'. 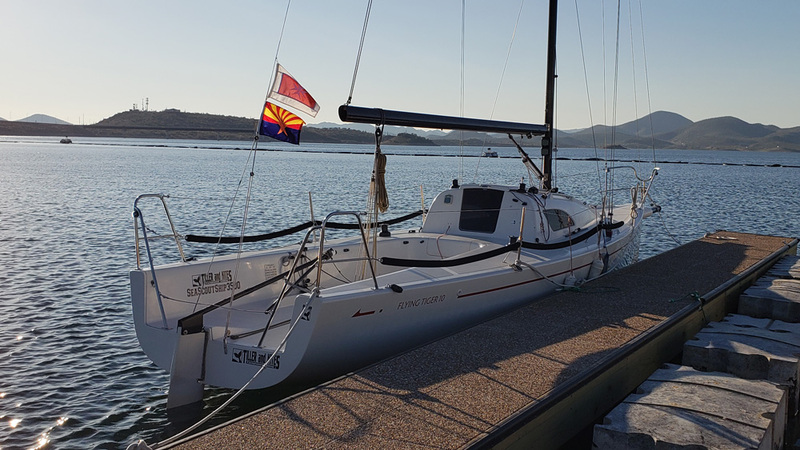 There probably is no better way to see the beauty of Lake Pleasant than onboard one of our well prepared sailboats or any of our other sporting sailboats. Any boat will be the perfect platform for a relaxed or exciting cruise with your closest friends. A Lake Pleasant cruise is typically three hours long with four or five guests (plus our skipper). It can be longer too if you would like to spend even more time on the lake. These cruises are scheduled around your time, your request and your agenda. To find out more or design your own sailing cruise, please inquire using the from below. All cruises are on a first-come basis. Please be advised that if the Skipper in charge decides that the conditions (wind, waves, temperature) are NOT right for a safe and enjoyable experience, an alternate date will be rescheduled. You will be given as much advance notice as possible. Imagine being able to say "This weekend we will be on the company yacht" without the expense and commitment of actually owning a Company Yacht! Tiller and Kites yachts are a perfect platform for team building, rewards, or just plain 'we worked hard, we deserve a break'. You can now have your Company Yacht for a day, a weekend, a month or an entire season. Get in touch with us and let's design a program that meets your goals and budgets. If you have never considered sailing as part of your program, now would be a good time to offer your company and employees something truly unique. Please complete the following form to inquire about a cruise. Pricing is based on the numer in your group, the type of boat and 'experience' chosen. Whether you want to be a pirate, a mermaid or just relax and enjoy the ride - a Tiller and Kites cruise will match your needs and expectations. Enjoy the lake: You and three of your closest friends! This is an "all sailing" cruise to as many coves and points of interest as possible. Tell us what you would like to do - sail, lunch, relax, photography,.. if it can be done, we will make it happen. Please inquire about your ideal cruise. Watching the sun go down while on the lake is a magical and memorable moment. For something truly special, you may want to try this!. YOU: "I spent the weekend sailing". Your co-workers: "I raked gravel".